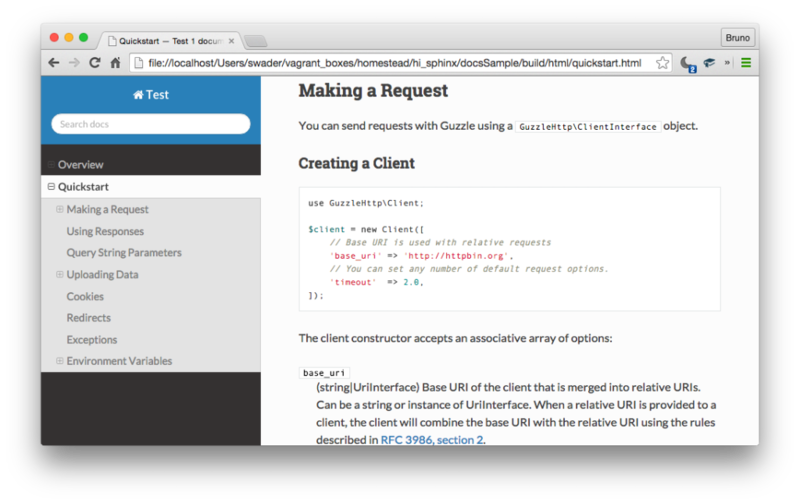 I recently had the need to write proper prose-like source-code documentation for the Diffbot PHP client. Having looked at several documentation generators, and even having suggested a @prose tag for importing of related MD/reST documents into method and class descriptions, I realized there simply is no perfect solution we can all agree on (yet). So until I extend Sage with a @prose token and reST parsing, I opted for ReadTheDocs and Sphinx. RTD is widely used in the industry. It hosts powerful docs such as Guzzle’s, PhpSpec’s and many more. It supports reST alongside MD (or, to be more accurate, MD alongside reST), which is a huge plus as RST files are more suitable for highly technical documents. It can be run locally and generate offline-friendly HTML files, but it can also compile from documentation source available online and and be automatically hosted as a subdomain of readthedocs.org. That said, setting it up for a PHP project has some caveats, so we’ll go through a basic guide in this tutorial. The latter command supports several options you can add into the mix. 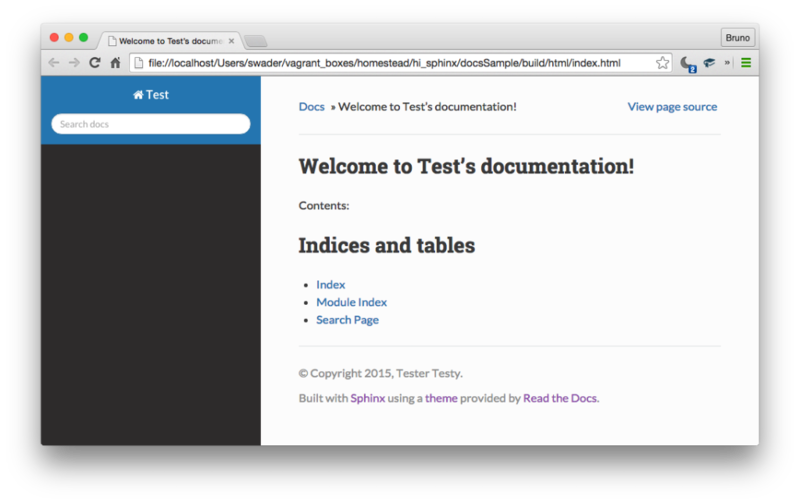 ReadTheDocs uses Sphinx behind the scenes, and as such is a through-and-through Python implementation. To make use of it, we need to install several prerequisites. We’ll use our trusty Homestead Improved to set up a brand new environment for us to play in. These tools have now made the command sphinx-quickstart available. the documentation in its own repository. Unless the documentation spans several projects or contexts, it is recommended it be in the same folder as the project. If you’re worried about bloating the size of your project when Composer is downloading it for use, the docs can be easily kept out of the distribution by being placed into the .gitattributes file (see here). When we run the command sphinx-quickstart, it’ll ask us for the root folder of our docs. This is the folder into which all other subfolders regarding the docs will go. Note that this is not the project’s root folder. If your project is at my-php-project, the root of the docs will likely be in something like my-php-project/docs. Next, Sphinx offers to either make a separate _build folder for the compiled version of the docs (e.g. HTML), while the sources will be in the root (defined in the previous step), or to make two folders under root: source and build, keeping the root clean. Feel free to choose whichever option you prefer (we went with the latter, for cleanliness and structure). Follow the rest of the instructions to set some meta data, select .rst as the file extension, and finally answer “no” to all questions about additional plugins – those refer to Python projects and are outside our jurisdiction. Likewise, when asked to create make files, accept. That’s not very appealing. This theme is much more stylish and modern. Let’s install it. Most themes follow the same installation procedure. Here is a short list. Hopefully, it’ll expand in the future. During the quickstart, a user is asked for the name of the master file (typically index). The master file usually contains little to no content – rather, it only holds directives. A reST directive is like a function – a powerful construct of the reST syntax which accepts arguments, options, and a body. The toctree directive is one of them. It requires an option of maxdepth, indicating the maximum number of levels in a single menu item (e.g. depth of 2 is Mainmenu -> Submenu1 but not -> Submenu2). After the option goes a blank line, and then a one-per-line list of include files, without extensions. Folders are supported (subfolder/filetoinclude). sphinx-quickstart on Sat Aug  8 20:15:44 2015. In the example above, Sphinx prints out Contents:, followed by an expanded version of the table of contents, i.e. a bulleted list of all headings found in the included documents. Additionally, many authors include extra information at the top of the master file to give a birds-eye overview of the library right then and there. See Guzzle’s. 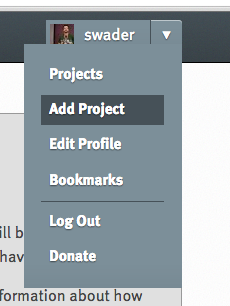 The toctree definition in the master file will be automatically mirrored in the left ToC navigation bar. 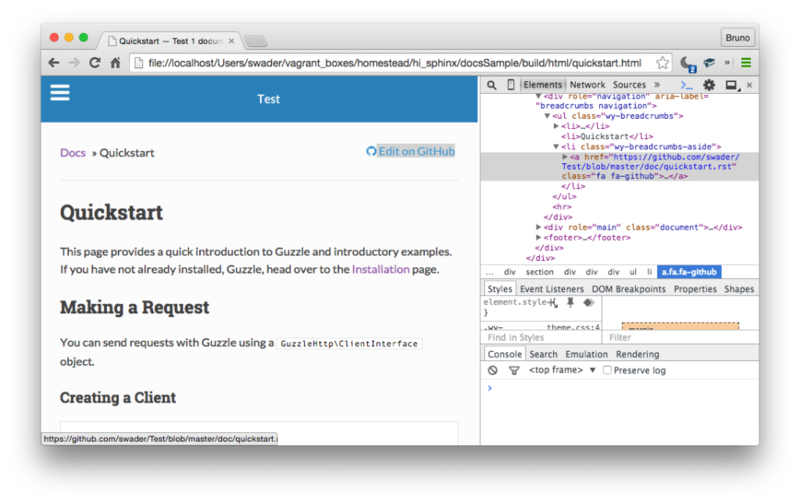 Let’s grab the overview and quickstart files from Guzzle so that we don’t have to write our own. 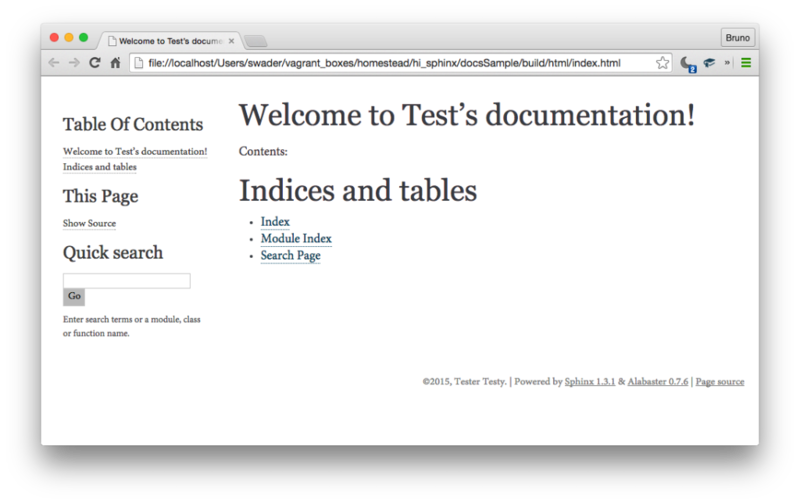 Put them into the root of the docs, and rebuild with make html. For more information about the toctree directive and everything it can do to give you truly customized output, see here. If we look at the quickstart document, we’ll notice that the PHP samples aren’t syntax highlighted. Not surprising, considering Sphinx defaults to Python. Let’s fix this. After adding the above into the configuration file, a rebuild is necessary. 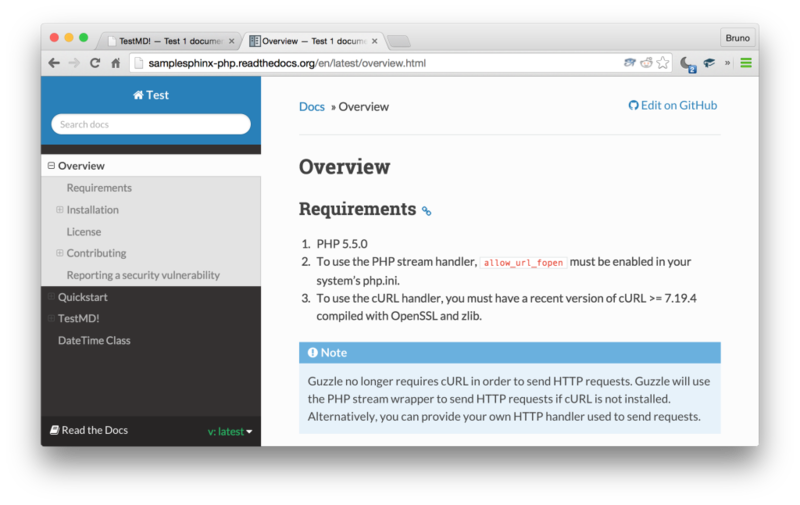 Additionally, we can install the PHP domain. :param int $year: The year. :param int $month: The month. :param int $day: The day. 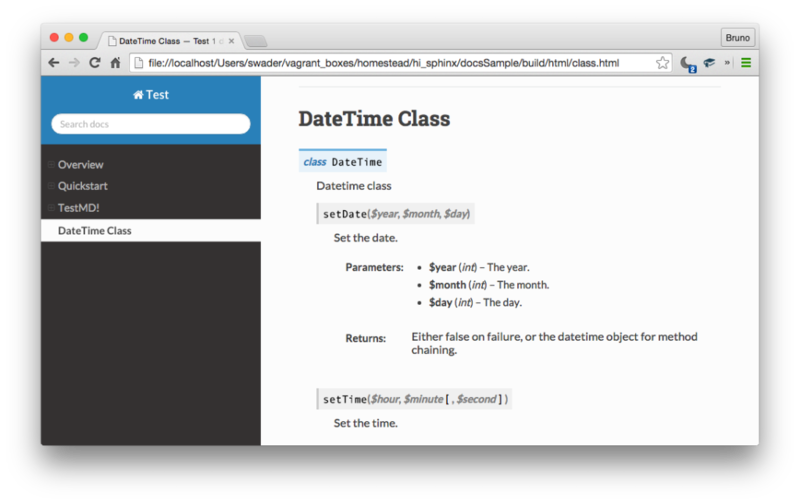 :returns: Either false on failure, or the datetime object for method chaining. Note that without the PHP Domain installed, this screen would be empty. This doesn’t look too bad, but it could be better. We’ll leave the styling for another day, though. It is common for docs to include a link to their source files at the top, so that users can suggest changes, raise issues and send pull requests for improvements if they spot something being out of place. In the configuration options, there is a flag to show/hide these source links. By default, they’ll lead to _sources/file where file is the currently viewed file, and _sources is a directory inside the build directory – i.e., all source files are copied to build/_sources during the build procedure. Be careful to add this block after the project definition, else you’ll get an error about the project variable not being defined. Putting this at the bottom of conf.py is generally a safe bet. For a quick and dirty intro to reST, see this, but also look into the custom markup added by the Sphinx team – these additional features help you get the best out of your documentation. ReST has many more features than MD does, so for parity’s sake and an easier transition, here’s a great conversion guide and a one-for-one comparison of features neatly laid out in tabular format. Sometimes, you may not be willing or able to convert existing MD documentation into reST. That’s okay, Sphinx can dual-wield MD/reST support. echo "Here is some PHP code!" Rebuilding should now show the MD content as fully rendered – with one caveat. The syntax won’t be highlighted (not even if we put the code into a PHP code fence). If someone has an idea about why this happens and how to avoid it, please let us know in the comments. 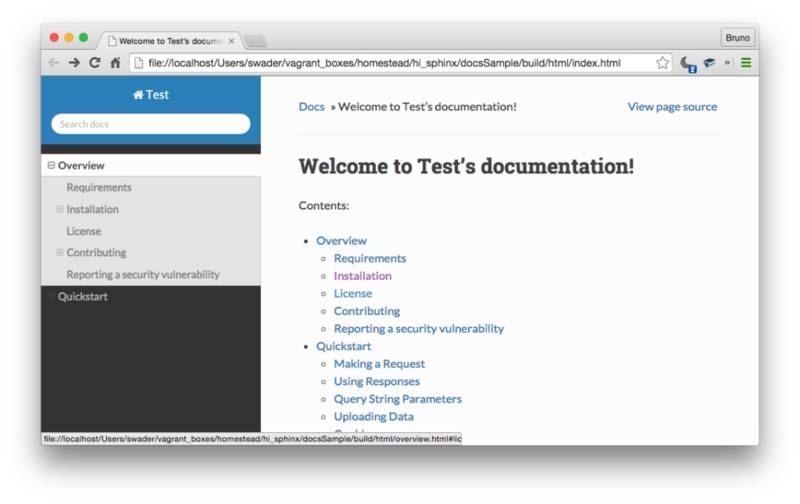 Now that our documentation is ready, we can host it online. For the purpose of this demo, we create a repo of sample content at http://github.com/sitepoint-editors/samplesphinx-php. The next screen asks for a connection with Github. After importing repositories, we click Create on the one we want to create an RTD project from and confirm some additional values which can all be left at default. Note: this check used to be required, but RTD seems to have fixed the issue and you can now use the same theme declaration both in the local version, and the live one. Earlier in this tutorial, we installed the PHP Domain for easier directive-powered PHP class descriptions. This extension is not available on ReadTheDocs, though. The freeze command will generate a long list of modules, and some of them might not be installable on ReadTheDocs (Ubuntu specific ones, for example). You’ll have to follow the errors in the build phases and remove them from the file, one by one, until a working requirements file is reached, or until RTD improve their build report to flag errors more accurately. After re-running the online build (happens automatically) the documented PHP class should be available, just as it was when we tested locally. … save and close it, and then load it with the command source ~/.bashrc. The error should now no longer show up. The first command removes the build folder’s contents completely, forcing Sphinx to regenerate everything on make html. If your builds fail and you can’t discern the reason, explicitly defining the location of conf.py under Advanced settings in Admin sometimes helps. 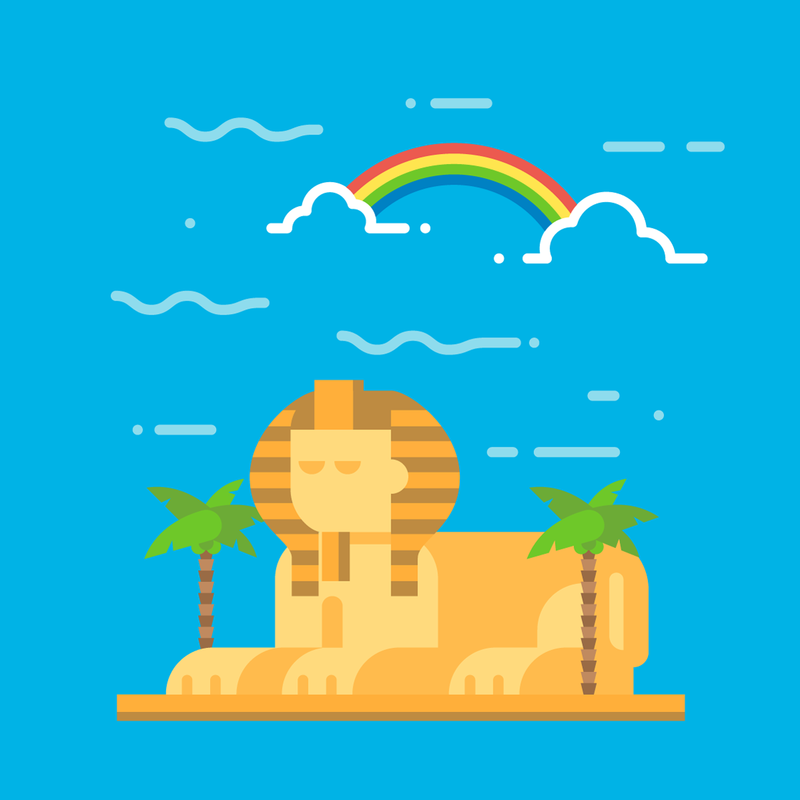 In this tutorial, we learned how we can quickly set up a Sphinx documentation workflow for PHP projects in an isolated VM, so that the installations don’t interfere with our host operating system. We installed the PHP highlighter, configured the table of contents, installed a custom theme, went through some basic ReST syntax and hosted our docs on ReadTheDocs. In a followup post, we’ll focus on styling, documentation versions and localization. Do you use another documentation writing workflow? If so, which and why? Any other Sphinx/RTD tips? Let us know!